"Arab-Israeli War" redirects here. For other uses, see Arab–Israeli War (disambiguation). At this point in time Jewish immigration to Mandatory Palestine continued, while to some opinions a similar, but less documented, immigration also took place in the Arab sector, bringing workers from Syria and other neighbouring areas. Palestinian Arabs saw this rapid influx of Jewish immigrants as a threat to their homeland and their identity as a people. Moreover, Jewish policies of purchasing land and prohibiting the employment of Arabs in Jewish-owned industries and farms greatly angered the Palestinian Arab communities. [verification needed] Demonstrations were held as early as 1920, protesting what the Arabs felt were unfair preferences for the Jewish immigrants set forth by the British mandate that governed Palestine at the time. This resentment led to outbreaks of violence later that year, as the al-Husseini incited riots broke out in Jerusalem. Winston Churchill's 1922 White Paper tried to reassure the Arab population, denying that the creation of a Jewish state was the intention of the Balfour Declaration. The status of Jewish citizens in Arab states worsened during the 1948 Israeli-Arab war. Anti-Jewish riots erupted throughout the Arab World in December 1947, and Jewish communities were hit particularly hard in Aleppo and British-controlled Aden, with hundreds of dead and injured. In Libya, Jews were deprived of citizenship, and in Iraq, their property was seized.[context?] Egypt expelled most of its foreign community, including Jews, after the Suez War 1956, while Algeria denied its French citizens, including Jews, of citizenship upon its independence in 1962. Over the course of twenty years, some 850,000 Jews from Arab countries immigrated to Israel and other countries. In 1956, Egypt closed the Straits of Tiran to Israeli shipping, and blockaded the Gulf of Aqaba, in contravention of the Constantinople Convention of 1888. Many argued that this was also a violation of the 1949 Armistice Agreements. 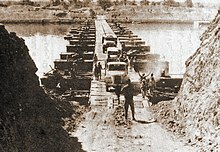 [not in citation given] On 26 July 1956, Egypt nationalized the Suez Canal Company, and closed the canal to Israeli shipping. Israel responded on 29 October 1956, by invading the Sinai Peninsula with British and French support. During the Suez Crisis, Israel captured the Gaza Strip and Sinai Peninsula. 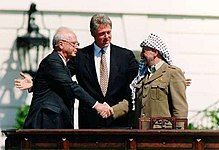 The United States and the United Nations soon pressured it into a ceasefire. Israel agreed to withdraw from Egyptian territory. Egypt agreed to freedom of navigation in the region and the demilitarization of the Sinai. The United Nations Emergency Force (UNEF) was created and deployed to oversee the demilitarization. The UNEF was only deployed on the Egyptian side of the border, as Israel refused to allow them on its territory. ^ US Department of State. "1973 MILESTONES: 1969–1976"[permanent dead link], 31 October 2013. Retrieved on 2 July 2014. ^ "'Israeli Airstrike on Gaza Threatens Truce with Hamas,' Fox News, November 4, 2008". Fox News Channel. 4 November 2008.